It’s time for Perfect Picture Books! What with Halloween coming up and all, I thought a book about monsters would be very appropriate, even if it isn’t specifically Halloweenie. 🙂 I loved this book from the opening sentence. I hope you will too! Brief Synopsis: Marilyn longs for her monster to find her. She tries to be patient and be the kind of girl no monster can resist. But the longer she waits, the harder it gets, until finally Marilyn takes matters into her own hands. And it’s a good thing she does! Why I Like This Book: Oh, gosh! Where to begin? The story is wonderfully original and entertaining, and relates to a theme all kids can understand – having to wait for things! Marilyn is so believably child-like in her behaviors and emotions. 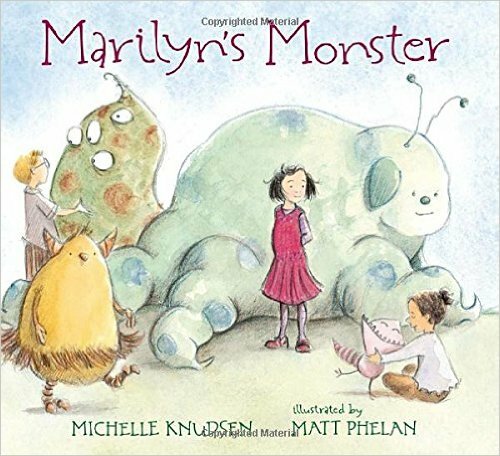 The art is delightful, full of wacky monsters that are tons of fun to look at, and Marilyn’s face and body language are so expressive. Marilyn goes against expectation without being disobedient or breaking any rules, so it’s a nice way to model doing what you know is right, or being true to yourself. And the resolution is surprisingly sweet. Across the board, this one is a winner! PPBF bloggers please be sure to leave your post-specific link in the list below so we can all come visit you! I can’t wait to see what shows up on this week’s list! I will be at the New York State Sheep & Wool Festival in Rhinebeck, NY this weekend, along with Iza Trapani and Nancy Shaw. Please stop by and see us if you’re in the neighborhood!! !